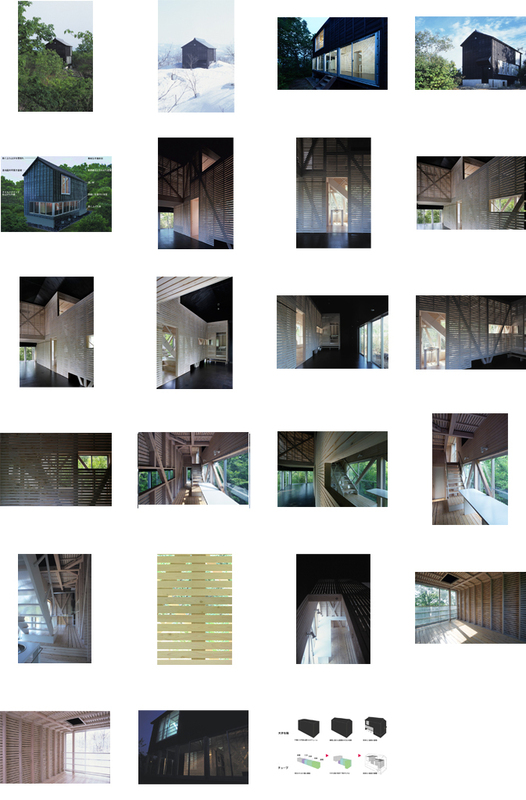 A public cottage located in a heaviest snowfall region in Japan, often as deep as 4 m.
The architectyure is composed of 2 volumes. Big Box as the outer form finished in black is designed for the maxiimum volume possible within the given budget and realized with details in accordance with local techniques for withstanding heavy snow. The essential functions for living were placed in a row called Tube. It is finished in white. Upon integratinf the two, Tube is bent comlicatedly by the restriciton of Big Box, and Big Box is cut irregularky by the bent Tube. The Gap between both generates an unexpected space. The two space makes the contrastive viewpoint which looks at surrounding nature. The exterior wall is finished in the traditional way of this region. It looks like local houses which locals are used to seeing and not consious of it : a consideration that the site is within in a park. The Cottage is disposed according to the axis of north, south, east and west. Therefore, they are conscious of the cardinal points as an axis of the earth. Ckick the following photos in order to see the enlarged one.